Hmm…time for my 4:00pm snack and it has to be 150 calories or less. I chose grapes, red Spanish grapes to be exact. 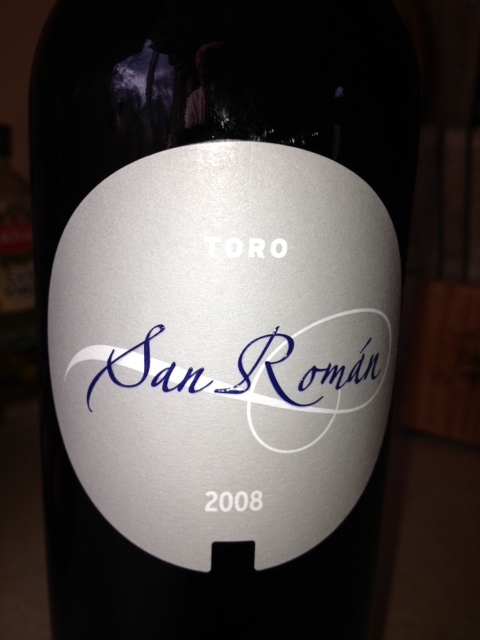 I will be snacking on some Tempranillo, a 2008 San Roman Toro ;). I have no recollection where I purchased or if I previously tasted the wine. I’m going to enjoy this treat. The color is dark as ink; big chocolate, spicy, with a hint of molasses aromas. I examine further and feel the wine chilling my fingers. I need to check the temperature controls on my cooler; it should not be this cold. I cradle the glass-warming it in my hands. A full-bodied red wine should be served at 60 degrees. A red wine too cold may distort the color; however, this is not case with 2008 San Roman Toro. The color is deep and rich. If you’re storing a previously opened bottle of wine in the refrigerator, allow 20 minutes to pass before serving the wine. Okay, approximately 10 minutes has passed 🙂 I cannot wait any longer. Let’s do some tasting, very spicy, soft tannins with a smooth finish. I’m going to wait another 10 minutes and try this again. TIMES UP! The color is amazing, rich purple-black color. Aromas – chocolate, spicy and hint of blackberries. Taste – spicy, soft blackberry flavors. I’m picking up a slight earthiness. A hour later, still sipping and sniffing; the berries aromas are amazing and spicy flavors are more prominent. I’m enjoying my snack, DELICIOUS! By the way, it paired well with the Light Shepherd’s Pie :).